The world of communication has revolutionized the changing prospect of every career field one can find today. And with the changing times there are so many exciting career lined up for today’s youth. One such field that is rising today is Mass Communication, and why not when it is offering too many exciting options in different kinds of Media such as Newspaper, Magazine, Radio, Television, Advertisement, Public Relation etc. Mass communication is a collective term which clearly means communicating with the masses through different media. It is more suitable for those individuals who are outspoken, extrovert, bold and passionate about their profession. Today, media is a powerful industry in India and has an influence over large part of Indian population. This offers a wide scope of media with number of exciting opportunities. Now a day’s mass communication is not limited to journalism alone. To a great extent mass media is a modern reality which covers all aspects of human life. Moreover, a great change can be observed in the concept of people working in mass media. Careers in Mass Communication are not only high paying but also bring in a great deal of job satisfaction and expression of creativity. 1. Print Journalism: Print journalism has been one of the oldest forms of journalism. The newspapers and magazines today cover a wide range of specialized sections like political events, business news, leisure, cinema, sports, career, health and so many other subjects, which demands for professionally qualified journalists. 3. Advertising: Advertising is a form of communication through effective mediums of communication for Brand Building process of a product, Idea or even sometimes service. Now a days starting from Newspaper, Magazine, Posters, Signboards, Internet, Advertising has come a long way and become an important tool for most of the organization. Advertising works are mostly depending on their efficiency and perfection so the task of advertising professional becomes more and more challenging. Candidates with strong creative mind and have wish to explore new kind Brands will find a good way to explore this course. 4. 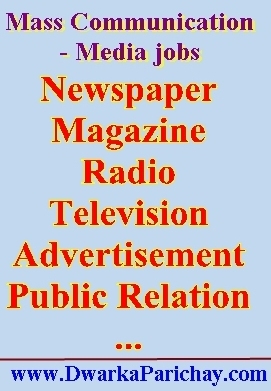 Public Relation: Public Relations mean managing information between organization and the public. It also generates and portray positive image of an organization by various media channels. People who really want to make as successful career as a PR consultant, it is important to have liking to meet people along with excellent communication skills ability to interact and also building rapport is Important for a PR people. Favorable media coverage about a company or product often reaches these audiences as well and may offer potential benefit to the marketer. Quick decision making and good organizational skills is also an important quality which a PR consultant should have. The skills acquired through a mass communication education are not confined within any particular job scope and are applicable across a broad range of careers. Students graduating with a degree in mass communication can find employment as journalists, editors of publishing houses, public relations and corporate communications professionals, as well as fields like advertising, event management and even marketing. Other than the communications sector, the global nature of the skills truly transcends all careers and ensures that even the business world is thrown open before the young mass communication graduate. In fact, once you’ve acquired great writing, verbal communication, thinking and analytical skills, there will be no limit. The broad expertise acquired through the mass communication course allows the student to adapt and transform his skills to the requirements of any career. The field of mass communication being widely spread, so you require different combinations of skills and traits, as because different qualities are asked for different areas. In general excellent communication skills with fair writing skills, with a good team player are the important. Beside these your confidence and Hardworking also matters a lot to progress in these Industry. Other than communication sector, the global business world is also is also open before a mass communication graduate. In fact once you have acquired grate writing, verbal communication, thinking and analytical skills there will be grate no limit. The expertise acquired through the mass communication course will allow the student to adapt and transform his skills to the requirement of his career.